Yes! I am sure you are shocked, amazed and wowed by the title of this post. Today I was just surfing around YouTube and was amazed to find a video which I wanted to share it with you. Then I googled about it and found a lot of different things and views about it. The first video here shows the Holographic SMS Text Messaging on the iPhone. 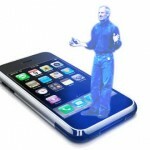 Some guy posted an application on Google Apps and claimed that it can create a holographic image/video of on the iPhone. Yes! This is actually not holographic thing but it is a 3D video. You rotate your mobile and the video rotates too because of the iPhone’s builtin accelerometer. So it appears like the Cat is actually out of the screen. You can check out the blog of the creator of this app here.